I’ve decided to post highlights from an entire week for the remainder of the year. So, here’s the Friday before Thanksgiving break through the whole week after break. We’re closing in on the end of the semester, so there are some potpourri activities going on in here. First off, we all did the light bulbs lab (here it was in 2013). 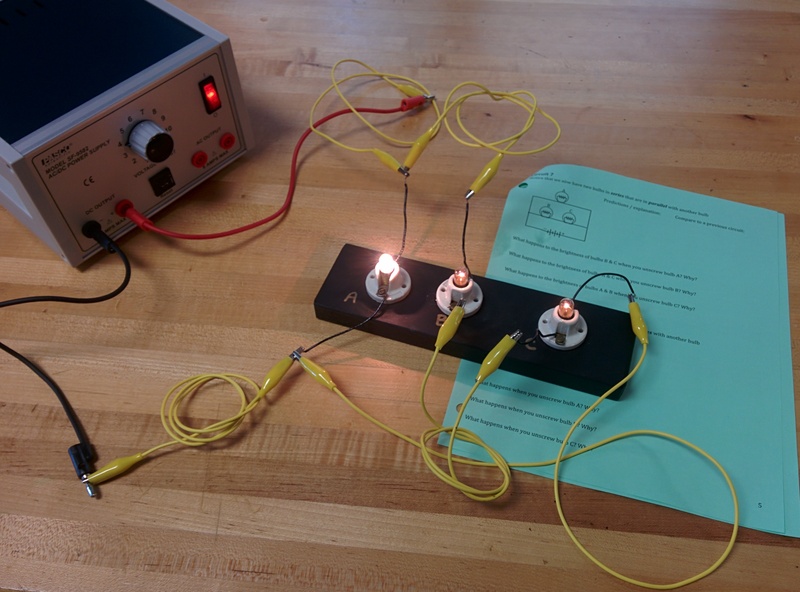 This has proven a great method of teaching how parallel and series connections work before kids learn about resistors, which I think are more abstract. The biggest struggle this year for most kids was with moving from the wiring schematic to the physical configuration. We run through eight circuits over approximately two days of work. My only wish was a better way to connect light bulbs to resistors, which we study next. Specifically how resistance adds in series and parallel. Below, I demo a part of the lab for you.